Akila* and Kannagi*, two middle-aged women, had just completed their shift when I approached them to learn about their experience of the Mahindra World City (MWC) Special Economic Zone (SEZ). Both of them are coolies (daily wage workers), responsible for the day-to-day upkeep — the sweeping of streets, the watering of plants and trash pickup — in the MWC. I was surprised to hear that they currently live in huts without access to toilets. Just years prior, before being bought out by brokers working at the behest of the MWC developers, Akila had been a landowner. She didn’t fit the stereotype of former landowners who had used proceeds from land sales to improve their quality of life. Rather, she had to sell her share of family-owned land under duress, to raise funds for her daughter’s wedding dowry. 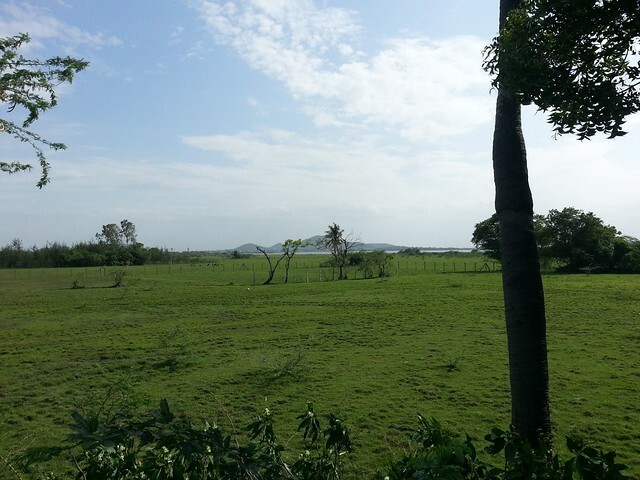 Barren fields in the vicinity of the special economic zone. Akila’s case is but one example of how unevenly gains from the MWC were distributed. MWC-hired brokers used a ‘divide-and-conquer’ approach in convincing landowners to sell their land. They customized compensation packages according to the unique circumstances of each landowner, enticing them to disregard their suspicions about the promised jobs and “development”. Landowners were warned not to discuss their compensation packages with their neighbors or relatives to avert any kind of community organizing or resistance, and brokers threatened to reduce their compensation packages if they did so. Hence, only affluent community members who had access to influential politicians or participated in brokering deals, could afford to ‘wait and watch’ and secure bigger gains. Those who refused to yield to the brokers’ offers, either in anticipation of a higher deal or to avoid risking their source of livelihood, were at risk of having their land acquired by the Tamil Nadu (State) government. A few of these individuals filed court cases protesting these forced acquisitions. But, seeking legal redress was only an option for the minority who understood the legal system, had the resources to hire a lawyer, the time to attend court hearings, and were not afraid of repercussions from the courts or police. Law enforcement and the judiciary largely sided with the State and the SEZ developers. Many of those who filed cases in an attempt to resist the forced acquisition of their land were eventually co-opted by developers offering them higher compensation. In the long term, even those who resisted these offers ended up losing legal battles, and were eventually forced by the courts to give up their land. Villagers belonging to the dalit caste groups, who inhabited the poramboke lands (common village property), were the most affected since they had no legal standing to demand compensation. Their informal protests received no support from the upper caste, the landowning majority, or the state. Home of one of the “corrupt” political leaders. Community members were frustrated because whenever they approached local political leaders for help to contest land acquisitions, they were “persuaded” to buy into the SEZ development either by local leadership who negotiated a higher compensation package or brokered a promise for a job. “They [local political leaders] must have been paid off by the company” ranted some villagers. But one village leader, Thangaraj*, vehemently disagreed. He asserted that they were only acting for the betterment of the community. “How else would people go from making 30 rupees a day to 200 rupees?” he asked rhetorically. Other leaders claimed that there wasn’t a lot of room for negotiation with the higher, State-level authorities or the developers. They said that when granting permission for transfer of village common property lands, they tried to, safeguard community members from forced relocation, negotiate employment offers, and demand continued access to village roads, open spaces and temple lands falling within the SEZ boundary. In 2011, several years after some of these conditions remained unfulfilled, one village leader submitted a petition to the government questioning the developers’ failure to meet commitments. Along with other villagers, he staged a rasta roko dharna, a road block protest. At that point, compensation packages varied so much that community members were not sufficiently compelled to unite in protest. In the end, the demonstration did not yield meaningful results and eventually fizzled. 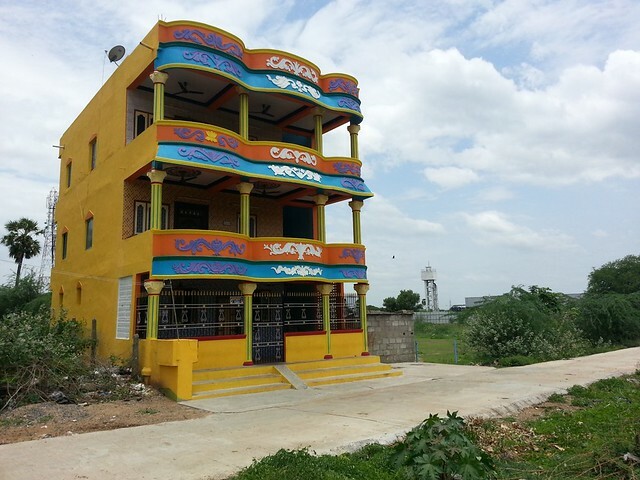 “[The SEZ developers] came, mingled well with the locals, set up a company, and when they started making profits, they sidelined the people” complained Gunasekaran*, a former farmer. Like him, many people who sold their land are dissatisfied. In retrospect, many feel that they were cheated by brokers, especially those who have been unable to secure the jobs in the SEZ that they were promised. The well-paying, service sector jobs are concentrated in the Information Technology (IT) and Information Technology Enabled Services (ITES) sectors and many villagers do not have the qualifications, including English language skills, required for such jobs. Neither the developers nor the State have taken any steps towards workforce development in these villages. Of the 400-odd community members who are currently employed in the MWC SEZ, most are in low paying, contractual jobs such as housekeeping, security services, and gardening. The failure to deliver on the promises of employment is not unique to the Mahindra World City SEZ. Even where SEZs have provided employment to communities from surrounding villages and small towns as in the case of the Nokia SEZ located a few miles away from MWC, the promise has been rather short-lived. In November 2014, less than a decade after it was formed, the Nokia SEZ closed its production facility due to an ongoing tax dispute with the Indian government. Consequently, several thousand Nokia employees, and those in allied small-scale businesses such as packing in Kancheepuram district have lost or are at the risk of losing their jobs. 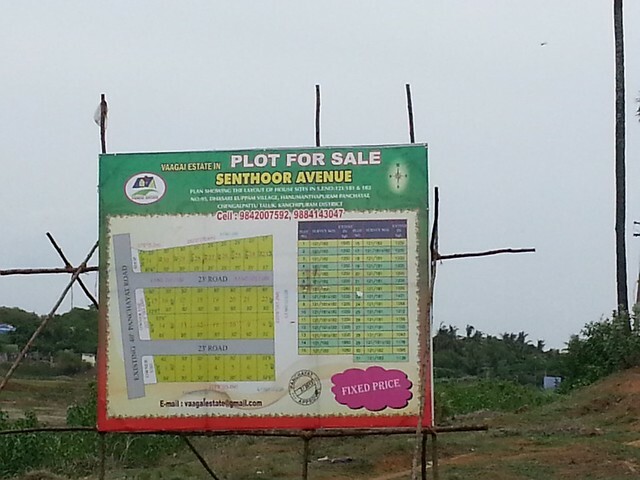 A billboard showing land speculation. Even though the MWC SEZ development has not yielded formal jobs for many community members, a number of individuals who sold their land are currently engaged in the informal economy supporting the SEZ. Ironically, many are providing affordable housing, shops and transportation services that cater to the day-to-day needs of the SEZ’s formal middle-class workforce, who cannot afford the “world-class” facilities in the MWC. 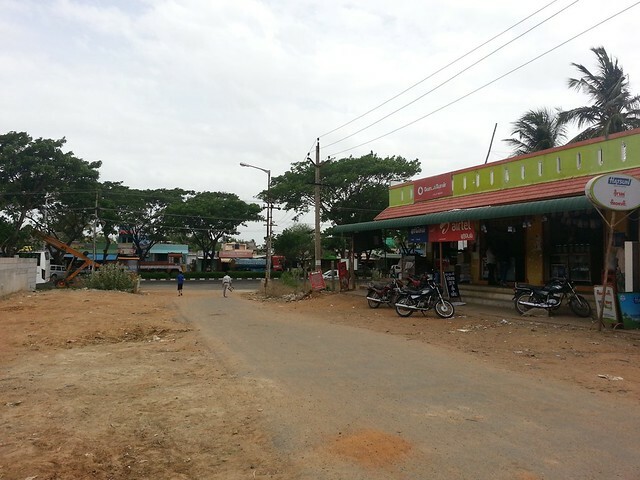 Shops and restaurants run by villagers. While the State, the MWC developers and a few community members proudly attribute the opportunities in the burgeoning informal economy to the SEZ, community members’ experiences show that these opportunities are not necessarily distributed equitably. Only those who profited significantly from the long drawn out land acquisition process –- landowners belonging to dominant castes or those with connections to brokers and powerful political leaders at the local or higher levels– were able to reinvest in informal local businesses or the local real estate market. Although liberated from oppressive caste-based work, landless laborers continue to work in contractual, daily wage jobs. The only difference is that their new jobs are in the service sector. They are living proof that the SEZ did not necessarily bring about any positive transformation in social hierarchies or power structures. The signs of widespread peri-urban transformation are ubiquitous in in many parts of India. They are the gated luxury residential enclaves, IT corridors, and SEZs. They often receive generous tax breaks and subsidies from the government under the auspices that they constitute “development.” But, we need to ask – development at what cost, and for whom? This is a question that farmers, civil society groups, political parties and concerned citizens have been raising in response to the much debated, and recently buried land acquisition bill. This bill seeks to amend ‘The Right to Fair Compensation and Transparency in Land Acquisition, Rehabilitation and Resettlement Act’ passed in 2013 to make industrial and infrastructure development projects exempt from certain stringent requirements instituted to safeguard affected individuals. For example, the land acquisition bill seeks to remove the requirements about obtaining consent from a majority of landowners, and compensating stakeholders such as landless laborers and tenants. The next post in this series will describe some of the arguments raised by various groups against the land acquisition bill, and reflect on how the MWC experience can inform this current debate in India. *Names have been changed to protect individuals who shared their thoughts. Post and photos by Nidhi Subramanyam. This series is based on Nidhi’s Master’s thesis titled, ‘Community Acquiescence to Special Economic Zones: The Mahindra World City SEZ case, Kancheepuram district, Tamil Nadu, India’ submitted in partial fulfillment for the Master of Regional Planning degree at Cornell University.